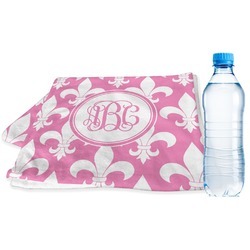 Go to the gym in style with a personalized sports towel. Whether you are running, doing strength excercises, or playing a sport, you need a good towel to wipe away your persperation. Don't settle for a boring towel! Get one that will be sure to catch eyes. These towels are 12" x 44", which are the perfect size for hanging around your neck on the treadmill or wiping your brow after a hard workout. 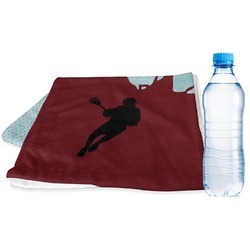 They are fullprint towels with your very own design printed right on the front! They are perfect for soaking up moisture and are quite soft against your skin. 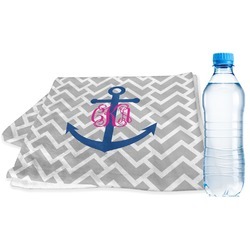 Create your very own design that will be printed horizontally on your towel. Start in one of our pre-made designs and change a little or change it all. You can pick which background, ribbon, font, label, and text you want! Create something that really shows off your personality. Need help in the design center? No problem! Just get on our online chat or give us a call. We are always happy to help you fulfill your designing dreams! If you are interested in this product you may want to check out our sports and activities section! Take a look at the golf tees and ball markers set or yoga mats!